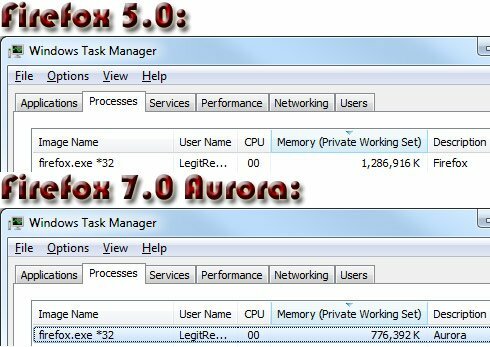 Legit Reviews checked out the new Aurora release of Firefox 7 and discovered the new memory optimization features in this version work wonders as the browser uses nearly 40 percent less memory compared to Firefox 5 when opening 117 bookmarked websites. They said on the Firefox blog post that an average user would see 30% less memory usage. Well, I opened all 117 of my bookmarks located in one bookmark folder using the 'Open All in Tabs' feature to see what would happen between Firefox 5.0 and Firefox 7.0a2 and the results were amazing. The difference between using Firefox 5.0 and 7.0 was very noticeable when it comes to memory usage as you can see from the task manager results above after all the pages finished loading.